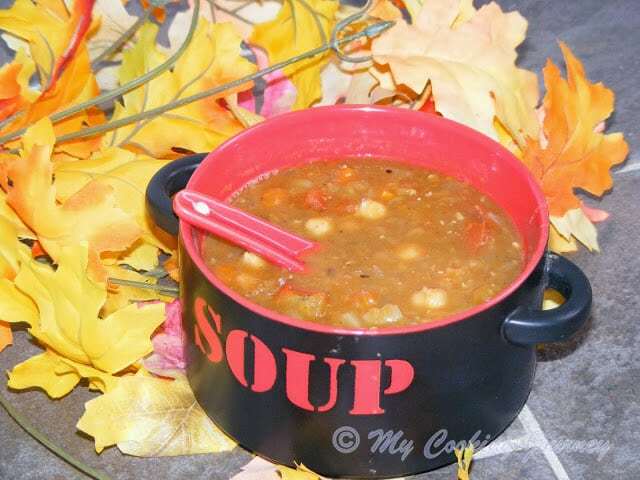 When looking for a recipe to make for the alphabet X, my husband came up with this soup which is a classic Libyan Beef and Vegetable soup with lentils and chickpeas. The name was very fascinating and above all the soup had a five spice blend in it which made it very aromatic. I skipped the meat from the soup and added vegetable broth instead of meat stock to make the soup flavorful. 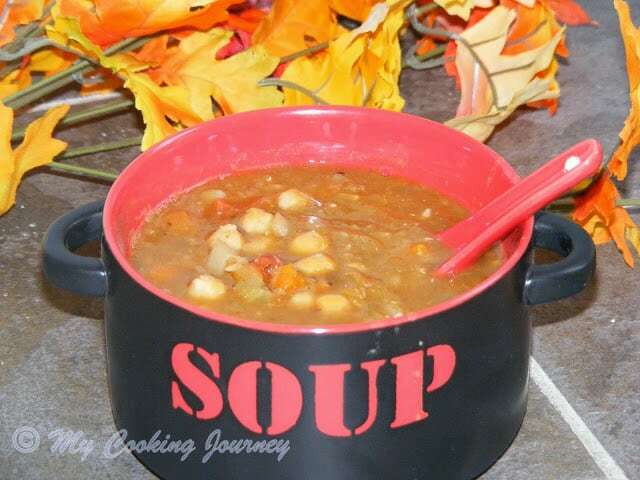 This was a very filling soup and it closely resembled the Lentil Soup that I had made earlier this month. 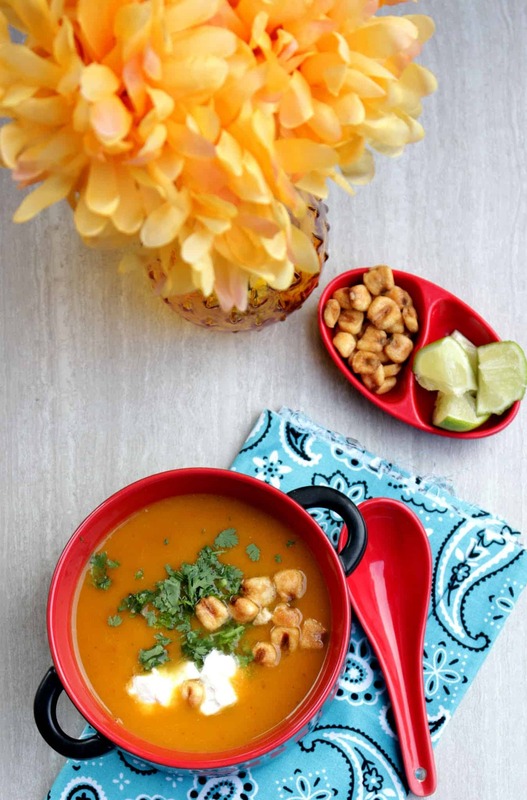 Fall has begun for us and I am all set with few new soup recipes that are right up my alley. 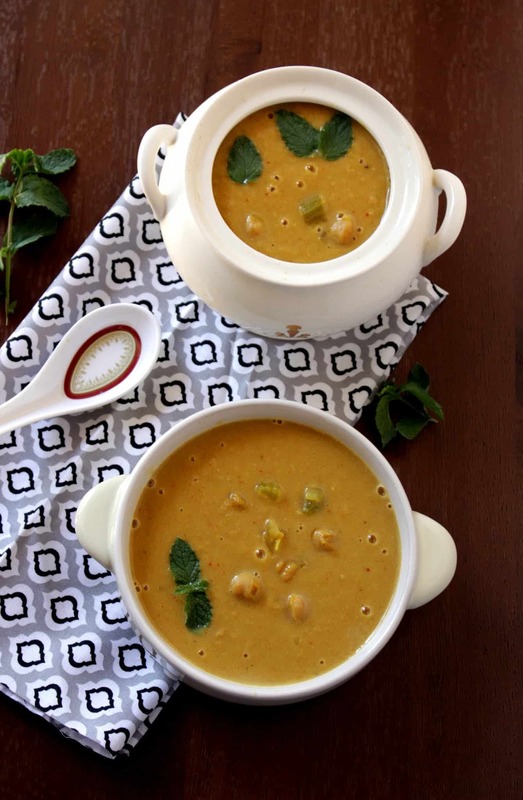 The soup had a liberal quantity of the five spice also called Hararat. This is a very classic Libya Five Spice blend that is used in many soup recipes. 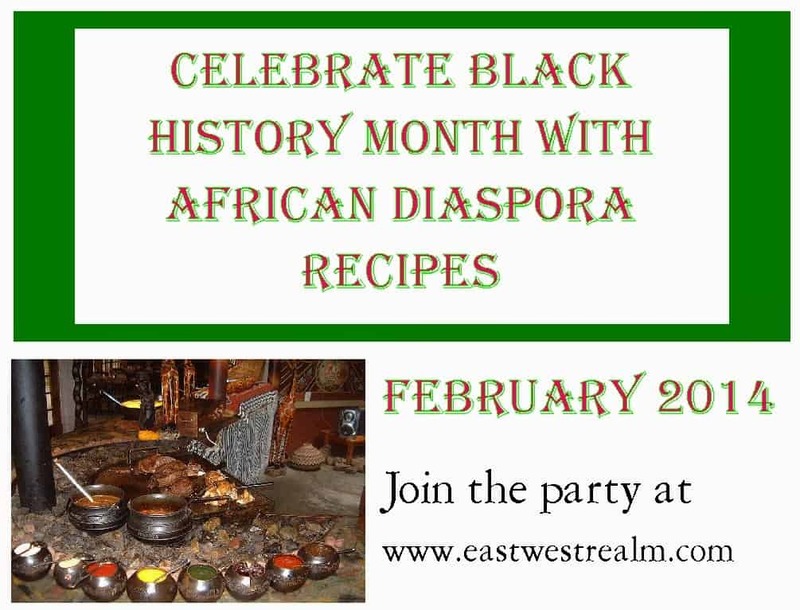 I found the recipe from here and when you get a chance, check out their vast collection of African recipes. I will be making a few in the coming days. 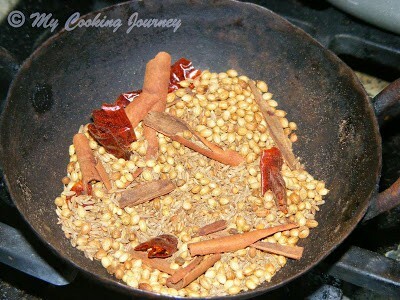 Dry roast the red chilies, cinnamon, cumin and coriander seeds until fragrant (about 2-3 mins). Once the spices are roasted add the all spice and then give it one stir. Turn off the flame and let it cool down. 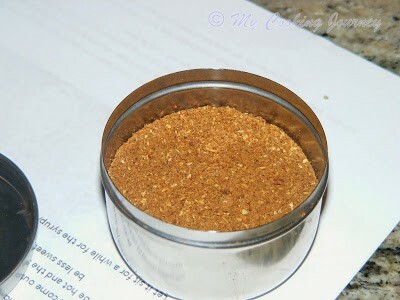 Grind the roasted spices into fine powder using a spice blender and store in an airtight container for future use. 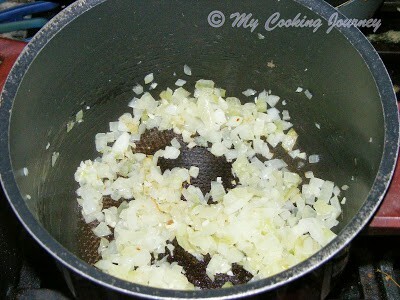 Heat oil in deep pot and add the chopped onions and garlic. Saute until softened (for about 5 mins). 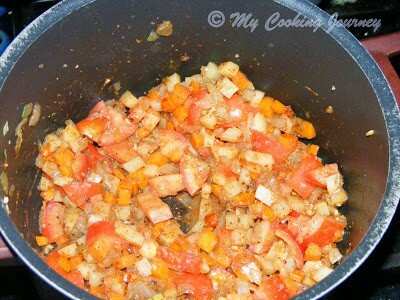 Add the chopped vegetables and fry it for 5 more minutes. 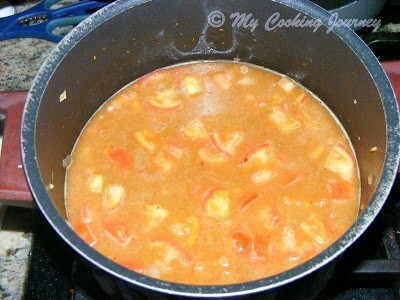 Now add the hararat spice, chili powder, salt, sugar and the tomatoes and mix well. Let it cook for about 5 mins more. Add the salt carefully since the broth will have some salt in it. 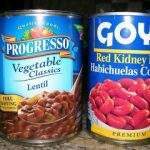 Add the washed and drained lentils and mix it well. 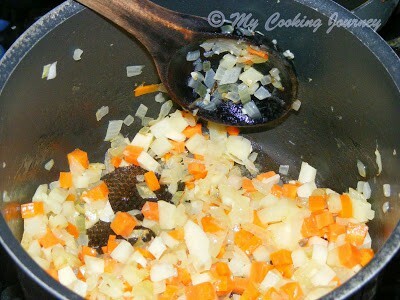 Add the vegetable stock and water. Bring it to a boil and then simmer for about 40 mins or until the lentils are cooked. Now add the cooked or canned chickpeas and let it cook for 15 more mins. 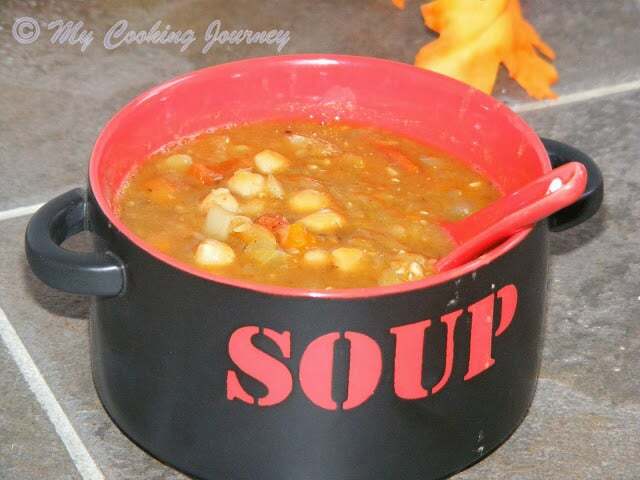 Check for the consistency of the soup and add more water if it is too thick. Serve hot with lemon wedges on the side or with some crusty bread. Wow that is a lovely choice for the alphabet. 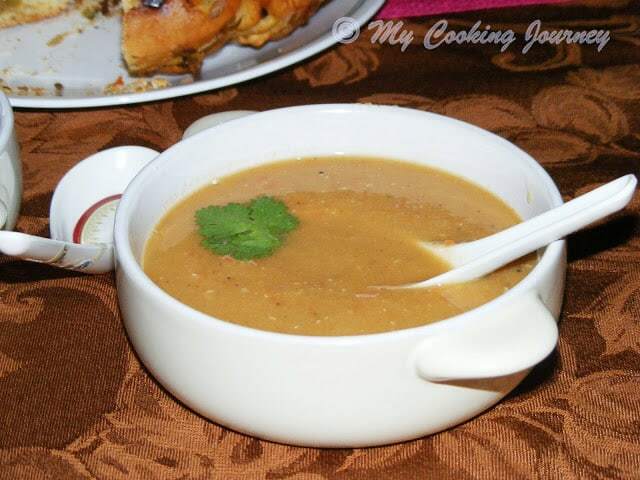 ..the soup looks healthy and I particularly like the spice mix and the name Hararat…super one Sandhya. 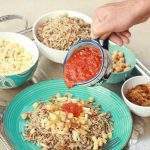 Xarba arbija looks very nutritious and comforting,love that spice mix. 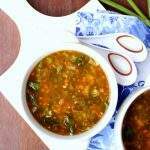 Loved your lenthil soup and this one is also great :-). 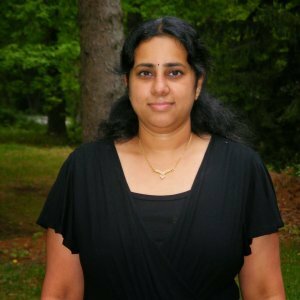 Its great to see the X recipes! 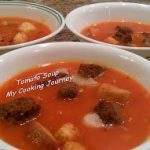 Such a delicious soup..and so healthy I am sure..enjoyed reading it..
That soup looks so delicious ! 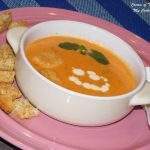 delicious soup and very well written post!! 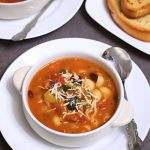 This soup come out so well and so healthy to. 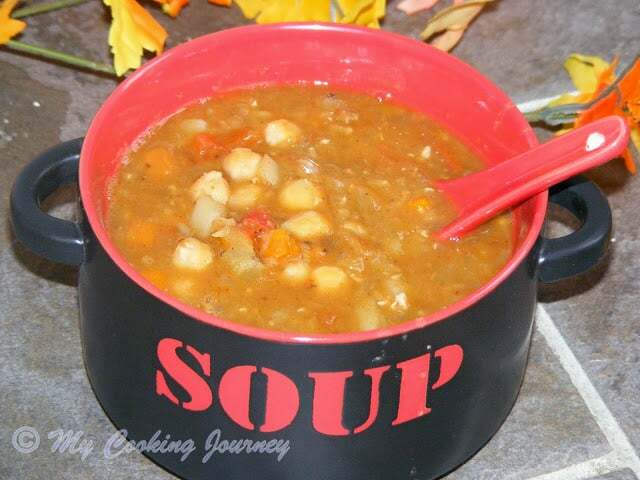 I want to try this soup soon. That spice powder sounds sooooo flavorful. Looks delicious and flavourful. I will try this when its winter here(Winters heer are a laugh) but then rite now its too hot. I love the spice mix.